Experience extreme adventure and extreme relaxation at Tree Top Adventure Baguio, the only motorized zipline in the Philippines and the only Team Building facility in Baguio. 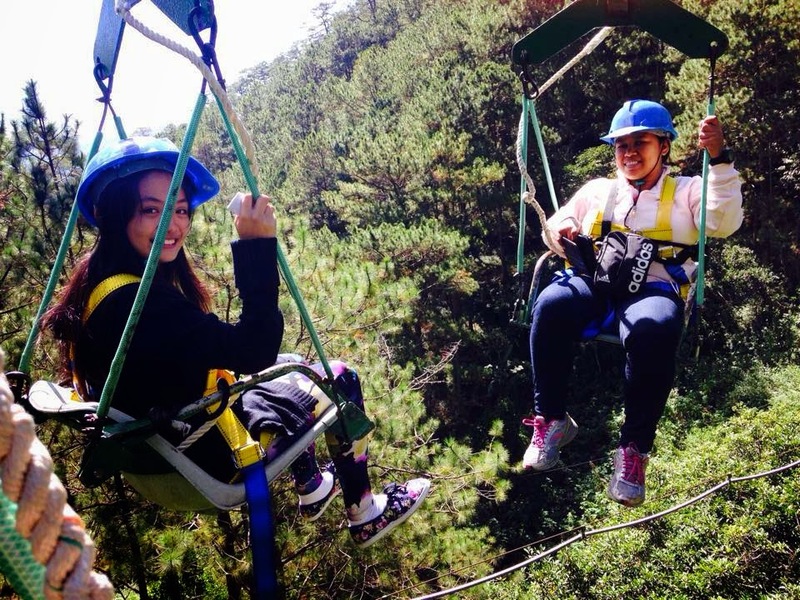 With seven outdoor activities and team building facilities, located within Camp John Hay, surrounded by pine trees and overlooking breathtaking views, Tree Top Adventure Baguio offers an adventure of a lifetime. For the thrill seekers who want to experience extreme adventure, you might want to experience our Tree Drop in which you’ll be suspended 60 feet above the ground, mission impossible style and you’ll be falling as fast as 2 to 3 seconds. This Tree Top’s most extreme activity costs Php 150.00 only and this is one way to really quench your thirst for adrenaline rush. You might also want to try our rides done in pairs: the Superman Ride and Silver Surfer. As the name implies, you’ll be ziplining, Superman Style, 200 meters long, 150 feet above the ground, but instead of doing it just forwards, you would also be ziplining backwards. Silver Surfer is a 60 degree diagonal motorized zipline in which you’ll be standing on a specialized platform and you’ll be gliding up and down for three cycles. Expect that there would be stops and swings for every cycle. For Php 300.00 and Php 200.00 respectively, you could experience what superheroes feel as they fly and glide through the air. For those who want to experience extreme relaxation, you could try the Canopy and Funicular ride which costs Php350.00. The Canopy is similar to the concept of cable cars, but instead, you’ll be seated on cable chairs in which you’ll be transferring from one station to another until you complete all eight stations. When you reach the station four of the Canopy, you would walk for around 2 to 3 minutes to be able to reach the connecting ride of Canopy which is the Funicular ride. This ride is similar to the concept of elevator, but, instead of standing up, you’ll be seated. This is at least a way for you to conquer your fear of heights. But, if you really have extreme fear of heights, you could just avail the Trekking and Skywalk in which you would walk around Tree Top’s area and go up the skywalk area, or the viewing deck in which you could see the mountains of Itogon, Benguet or what they call the old Baguio before. You could stay at the Skywalk areas long as you want to take pictures and feel the cold breeze. 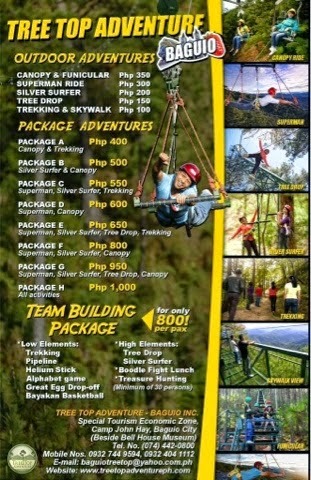 If your company plans to have a convention or seminar at Baguio, you might want to experience our Team Building Activities which includes two high element activities (Tree Drop and Silver Surfer), five low element activities, boodle lunch and facilitators for just Php 800.00 per head only.The activities would really challenge each member and how they work with their workmates. Work and play, as the cliché says! You might also want to try another branch of Tree Top Adventure Subic located at the JEST Area, Upper Mau Cubi Point Subic Bay Freeport Zone.